Original KSF-2 Super Feeder serviceable for years to come, made in USA and sold by Super-Feed for over 23 years! All parts readily available and easy to replace if ever needed. 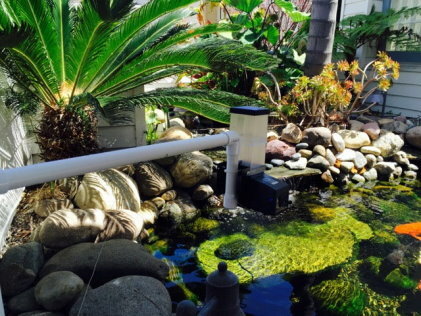 Battery operated, mount it your very own way to feed your koi pond fish. Adjust it from very tiny to larger portions up to 8 times per day all year long. 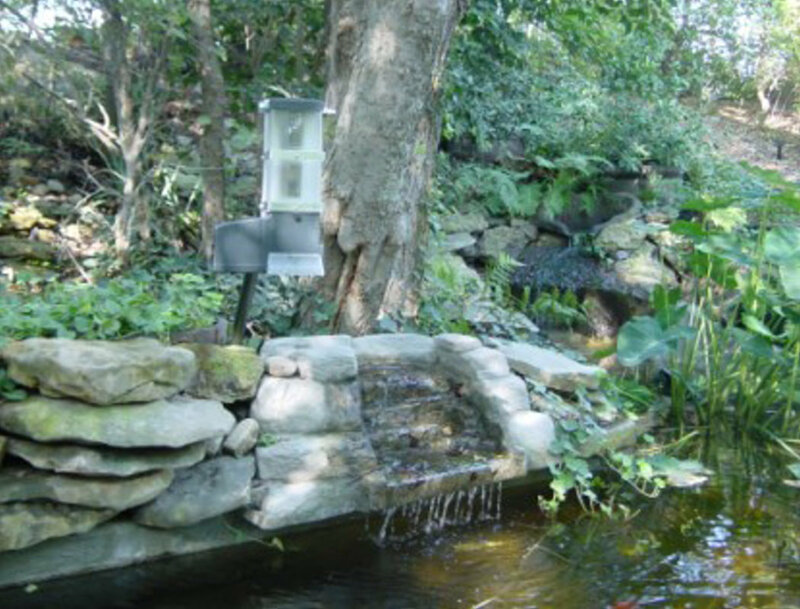 This great outdoor battery system combo deal includes: 38oz (1 Quart and 3/4 cup) Koi-Pond outdoor Super Feeder®, 12 Volt DC 'weekly" digital timer in outdoor approved metal box (mounts to post, wall) which will provide up to 8 daily feeding cycles plus 50 feet of wire. This DC digital timer set-up is the simplest to install and will hook up directly to any 12 volt battery to power itself and the feeder. 7 day digital timer will keep exact programmed time even when disconnected from its 12 volt battery source because of its internal battery back-up feature. This set-up is available for people who do not have a 120 volt power source available near their Super Feeder. All you will need, is a 12 volt battery. You probably will not need to recharge your battery for a very VERY long time (NO NEED FOR EXPENSIVE SOLAR PANEL), because the current draw is extremely low for the timer and the feeder will only run for a minute or so per feed cycle. With such a small battery draw and some ingenuity, you may even be able to install a small 12 volt battery pack inside the box. SEE "FEEDER ACCESSORIES" FOR OPTIONAL PIPE SWIVEL MOUNTS TO GET IDEAS ON HOW TO MOUNT IT OR PURCHASE ONE. READILY MOUNTS TO 4X4, 2X4 OR PIPE (not supplied).